Bigstock — one of the most expensive microstocks presented in our reviews. It has image gallery of 9-millions of photos and illustrations in rasterized and vector format and offers its customers to make single purchases spending from 1 to 6 credits depending on size and format of each file (see “What are the credits and what are they for?”). Though prices shown in credits are really low, the cost of 1 credit, which can be spent within a year, is pretty high. So, to buy minimal package of 6 credits you'll have to spent $13. In this case the cost of 1 credit is $2.17 and this is one of the maximum cost of 1 credit among all microstocks reviewed by PhotoBuyerGuide.com. But the more credits you buy the lower is the cost of each credit. And this is one of the main advantages of Bigstock: if you buy big amount of credits this microstock allows to purchase high resolution images for really low price — 12Mpx photo will cost only $5.94. The next feature that can be considered as disadvantage is lack of possibility to make purchases using subscription. This is explained by the acquisition of Bigstock by Shutterstock Images during the autumn of 2009. Also Bigstock has relatively low prices for extended licenses, differentiated in cost depending of the number of usage times: Single Use — 15 credits, Limited Use — 40 credits, Unlimited Use — 120 credits. Real cost of these licenses depends of credit package you buy and starts from $13.50. It's worth noting that Bigstock's Single Use special license allows you to single use purchased content in any derivative goods intended for resale. If you need to sell several items of your product then you'll have to buy the same number of licenses. It costs just 15 credits per license and it's much cheapier than other microstocks offer because their extended license means big number of uses. At Bigstock you pay only for your real needs. Great solution for small-scale business. For customers who need just 1 image there is a possibility to buy 1 image without preliminary registration or credits purchasing. But in this case image cost little higher than usual. Extended license for such kind of purchases is available as well. So we recommend Bigstock to customers, who are quite often in need of high-resolution images or searching images for extended license usage. To register on Bigstock click this link. 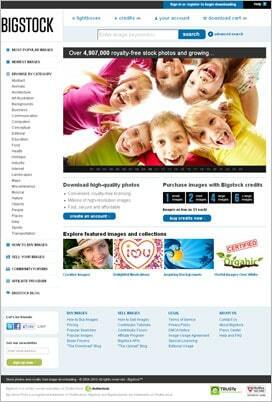 Try Bigstock free for 7 days. Download up to 35 royalty-free stock images. Maximal times to reproduce/display the content, or an element of the content: unlimited. Use the content in any derivative goods intended for resale: no. – “Unlimited Use” license: unlimited. +: possibility to buy 1 image without preliminary registration or credits purchasing. -: the range of images available is little less than other competitors have. Bigstock can be a good solution for those who needs large amounts of high-resolution images. Also it’s important to note such advantage as extremely low price of extended license for single use.